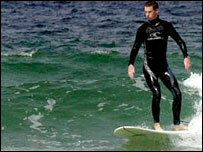 The Cornish resort of Newquay has been praised by a Labour MP for creating a new economy out of surfing. Phyllis Starkey, who chairs the Communities Committee, says the resort is thriving amid concern that most of Britain's coastal towns are in decline. A new report by MPs says many seaside towns face high levels of deprivation, poor housing and transient populations. But Newquay Association of Tourism and Commerce said the town was moving into a "new and very bright era". The town had benefited from an extreme sports centre and Jamie Oliver's Fifteen restaurant at nearby Watergate Bay, as well as regular surfing competitions and new holiday home developments. Lorraine Harrison, chairman of the Association of Tourism and Commerce, accepted that not all other resorts could compete on natural facilities. "We have got the surfing and the beaches and the competitions. "That's something that makes us different from a lot of other places, but it's not just the surfing, it's everything else that goes with it." Rowdy behaviour gave Newquay a bad reputation last summer, earning it the nickname "Little Faliraki". Local residents have complained about the concentration of pubs and clubs in town centre. Ms Harrison said the town's image had been hit, but a new town manager was working with pubs and clubs to clamp down on anti-social behaviour.